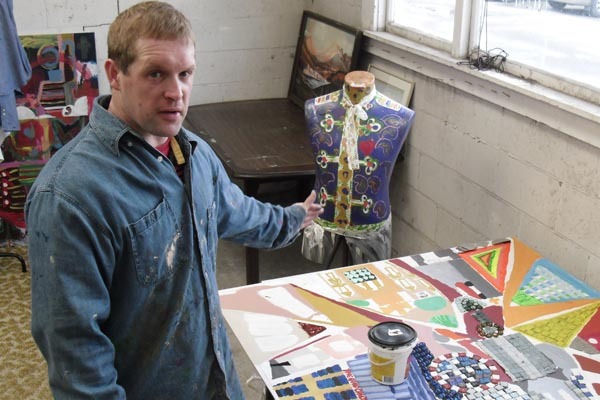 Benjamin Morris, an artist who works from the White Room creative space in Christchurch, is one of 60 artists featuring work in an exhibition at Canterbury Museum until 22 February. An actor and visual artist, Benjamin is exhibiting his sculpture alongside artwork by students, prisoners, art tutors and local artists. 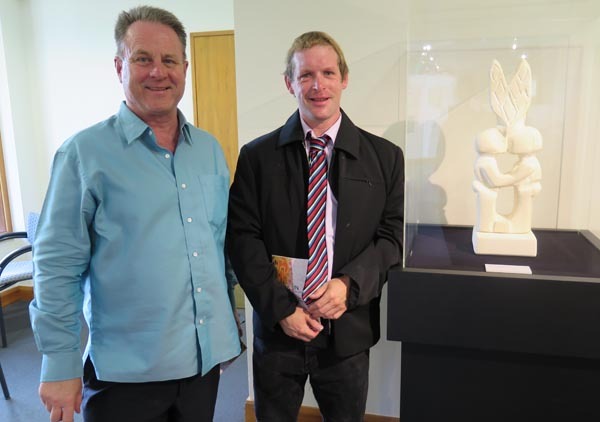 The sculpture is made of Oamaru Stone and called Krystal Kissing Kouple. "I have based it on myself and relationships," Benjamin says. "I think of myself as a romantic super hero and having a romantic relationship. "It's great to be an artist in this exhibition. It showcases a variety of other artists' work and also a different side to my artwork. This time it’s one of my sculptures rather than one of my paintings or collage works." Outside In is being co-ordinated and curated by Bev Lowen with Canterbury University's fine art graduate Gail Batchelor. Bev is also the facilitator of SkillWise's White Room, a community-based art space that supports artists with intellectual disabilities. "Benjamin is a prolific artist and he likes to work big. His artwork has developed alongside the development of the White Room," Bev says. Benjamin has been attending SkillWise’s art programme for five years. "I go there twice a week – one time independently and one time with a group,” he says. “My art has taken off from then to now. It has become much more dynamic. I know what I want to do now and can get an idea together. "When I start off with an idea, I think I'll draw it this way and then something else comes up. I've also done some still-life drawing classes, and I've learned not to look at a drawing from one angle but from any perspective." Benjamin often has a written description or a story about his work. However, in Outside In the artists have a statement they have written about their art in the exhibition catalogue but it is not connected with their specific art piece. Original generation time 1.7162 seconds. Cache Loaded in: 0.0165 seconds.